If you’ve spent any time around our social media, you know we love attending conventions as vendors. We’ll throw six boxes of books in our yellow sunmobile and drive fifteen hours for one weekend. Why? Because of all the various marketing tools, it’s the one that provides the biggest bang for the buck, in both reach, engagement, and customer retention. We’ve attended 40+ conventions since 2014, and perfected the art. Today, we’re sharing our best tips. First and foremost, find one! Most every city across the great US (and abroad, too) has some kind of comic book convention. The trick is to select one big enough to make your costs, or make sure you’re going into it knowing that you’ll lose money. There’s pros and cons for going big and the same for going small. Big Cons with Big Celebrities bring Big Numbers of people. But you usually don’t get the kind of one-on-one attention that turns passers-by into superfans. Also, they usually cost more, so if the event is a bust then you may lose money. Small cons are inherently riskier, even when you’ve only paid $50 for a table. 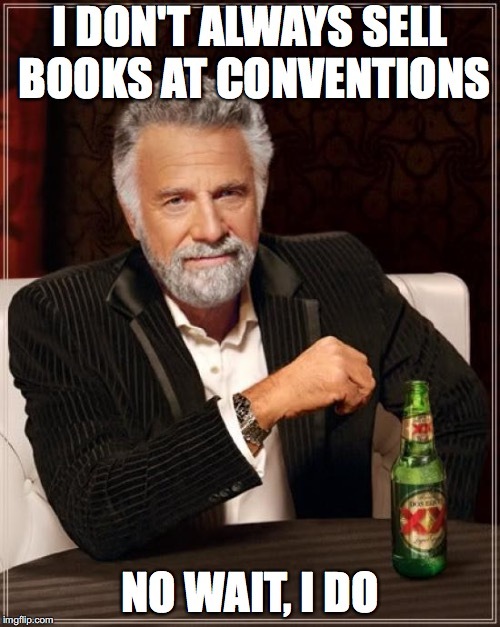 We went to one three day convention where the only books we sold were to other vendors and the convention chair’s mom. You want to do a little research before you put your money down. If you can’t name any of the celebrity guests, don’t pay more than $50. 9 times out of 10 all conventions need is your hard earned cash to get a table. Some cons do a little screening of their participants, so be aware if that’s the case. If you’re a small-time author, you’ll usually be a good fit for an Artist Alley. One thing to note: Many states have different rules around sales tax. Make sure to see what you’re on the hook for as an attendee. Once you’ve got a con and a date, it’s time to focus on your booth. You’ll be pulling people into your booth with your pearly whites and charm and charisma (right? ), but you need to make sure your booth set up looks professional. We’ve invested in a set of 8 foot banners (You can go shorter, but the 8′ makes a statement), and we can tell–definitively–they draw people to our booth. Trad pubbed kids–talk to your publisher. They might even have stuff that they can send you to use and then you don’t have to make your own. They can also send you books. Not everyone you talk to is going to buy a book. So you want to bring some kind of something for them to take away. Our old standby is a business card offering info about both our free downloads (Here and here). We’ve also started piloting a larger bookmark that contains a brief summary of our books, the cover, and the age ranges. The bookmarks also have a coupon for 25% off books sold on this website. 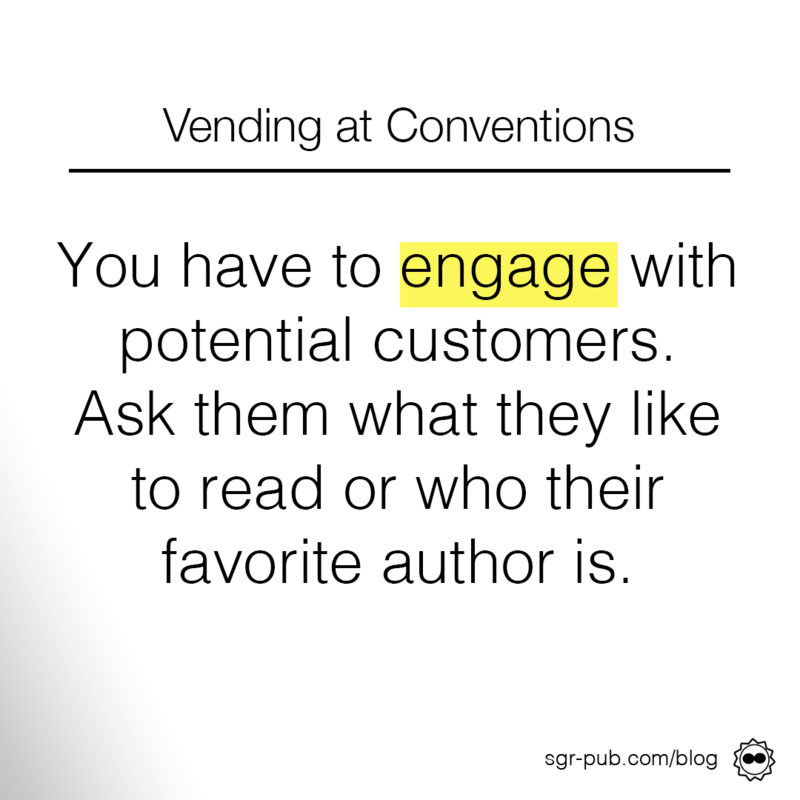 Conventions also offer an opportunity to grow your newsletter lists. If you’ve got an old tablet lying around, you can use an app to gather email addresses from interested parties. We usually offer a free audiobook to anyone who signs up, and, of course, they’ll get a free download of our anxiety dragon book. The number of books you should bring really depends on the size of the crowd and the numbers of helpers you have at the table. For most large conventions (20,000+ attendees), we will bring 30 copies of each book 1, 15 copies of book 2, and 5 copies of books 3+. Smaller conventions, we’ll either bring what we have on hand or buy maybe 15 of book 1. Keep in mind, however, that we have 15 books across 5 storylines, so there’s a bit of cannibalism in sales. When we had fewer books, we would bring more of each (at least a box of 40). Generally, you are selling people on the first book. For our booth, we offer a deal: Buy 1 book for $15, 2 for $25, or 3 or more for $10 each. If a buyer wants to grab just one, we can say, “Do you want to get another book for $5 more?” 80-90% of people who are offered this deal take it. This is especially beneficial when we’re sharing a booth, because our fellow authors can upsell our books, and we can upsell theirs. It does result in a lower overall number, but since you’re splitting the cost of the table, it all evens out. The biggest reason why authors fail at selling books at conventions is they don’t understand their audience. We’ve spoken a lot about soft selling, the idea of building relationships first, then selling. At a convention, on the sales floor, that’s where you get to practice the hard sell. Start by saying hello to every single human (and non-human) that walks by. Sometimes they’ll look like you’re going to murder them, sometimes they’ll ignore you completely. But sometimes, they return the hello. That one-second interaction is the difference between selling 10 books and selling 50 books. Want to hit the big leagues? Be prepared with your one-paragraph summation of your series. Once we’ve snared a potential customer, we’ll say: “I’ve got four kinds here: Space pirates, anxiety dragons, Romeo and Juliet stuck on an island, or Lady Harry Potter.” Quick and easy topic synopsis so we can gauge which is going to land. They’ll pick one, and we go directly into the schpiel. “Double Life is about a young woman leading a, you guessed it, a Double Life. Subtle title, no? (pause for laugh or eyeroll). In one life, she’s Lyssa Peate, planet discovering scientist, and in the other, she’s Razia–space pirate bounty hunter (the more interesting one is second to land the blow). Unfortunately, neither life is going very well (pause for laugh). As the bounty hunter, she’s one of the least (emphasize) wanted people in the universe and as the scientist, she just got a new intern who is definitely (emphasize) spying on her. Then that intern is mistaken for her hostage by the universal police (pause for effect).” Blah blah, more about the other books, release dates, etc. Make sure to keep a budget with your convention. It’s great if you make $1,500 in a weekend, but if you spent $3,000 on a five star hotel and airfare, it’s not really sustainable. The price of books can be anywhere from $4 to $7, depending on your printer and location. If you’re flying, shipping books to the convention can run you into the hundreds of dollars. We keep food costs down by staying at cheap hotels with free breakfasts, and also bringing food from home, instead of splurging on convention fare. Even better–choosing local conventions, or ones near to family and friends. At your booth, you’ll want to bring snacks, food, and water, and something caffeinated if that’s your speed. Our go-to are Bolthouse protein smoothies, as they’re quick to drink and last most of the day. Working a convention is exhausting, but they also provide the biggest opportunity for making money and meeting new fans. We’ve picked up new fans at conventions who bought our entire backlist in hardcover (from our store, no doubt), or who’ve been one-person cheerleading squads for our books amongst their friends.